The world’s advanced economies will see an increase in their carbon dioxide emissions this year, ending a five year-long decline, according to the International Energy Agency. The chair of a UK parliamentary committee wrote to the minister for business and industry to call for clarity on a series of issues relating to the UK’s relationship with the EU and Euratom and the government’s plans for civil nuclear in the event of a “no deal” Brexit. After two weeks of crunch negotiations the 197 parties gathered in Katowice, Poland, for the United Nations COP24 two-week climate change conference, adopted a “robust” set of implementing guidelines for the 2015 Paris agreement, aimed at keeping global warming well below 2C compared to pre-industrial levels. Last November 13th the GMF Assembly was held in Viene (Austria) wich was oppened by, Mr. Roland Palmqvist, President of GMF, who gave a welcoming speech and thanked the attendees for their presence. Then Mr. Mariano Vila d’Abadal, General Secretary of GMF, went through the different meetings and actions taken between October 2017 and October 2018.After this meetings explanation, Mr. Mariano Vila d’Abadal reported on the current situation of the accounts of GMF and explained the GMF’s 2017 Annual Audit Report. Those points wwre approved by the members of the Assembly. 1. - With a double goal of the enlargement of GMF and the future work on the economical impacts of closure of NPP, GMF aims to organize an open meeting of the presidium at the beginning of April in Fessenheim (France). The mayor of Fessenheim is the President of ARCICEN, the French local communities association, and at same time Fessenheim NPP is going to be shut down following political decision. 2. - ENEF: After two years out of ENEF, GMF has been invited to be part of the steering committee of that European forum. It gives us a new possibility to get to work at European level and to influence the nuclear debate introducing concepts as participation, emergency planning, economical effects... from the point of view of the local level. At same time it will give us more opportunities to lobby to promote GMF’s projects. 3. – In the frame of ENWD, next Wednesday 14th November, the meeting of this network will take place at IAEA facilities discussing about the association’s goals and activities. As the members of GMF decided, ENWD will organize two meetings during the year, one specific about waste and another during the general assembly. A proposal to visit Eurajoki in Finland in June 2019 will be discussed. 4. – Next assembly of GMF could be held in Paris at OECD facilities in order to learn about the Nuclear Energy Agency, the Forum of Stakeholder Confidence and establish the ground for possible exchanges in the future. In Paris, there would be the possibility to visit French institutions, such as IRSN or ASN, or we could organize a technical visit to Soulaines d’Huy where the LILW repository (Centre de l’Aube) is located. The members of GMF requested the sending of a calendar with the next meetings. It was approved that the next Assembly of GMF will be in Paris, in November, date to be determined. Finally, Mr. Mariano Vila d’Abadal and Mr. Roland Palmqvist thanked all of the participants and looked forward to seeing them next year. Moldova is committed to strengthening its regulatory framework for radiation safety but should strengthen regulatory independence in decision making and regulatory control over activities involving radiation risks, an International Atomic Energy Agency integrated regulatory review service team said. EU member states, lawmakers and the European Commission have agreed on an electricity market regulation and directive which will set rules for trading, balancing and capacity markets, the last deals of the bloc’s clean energy package. NucNet is in the process of redeveloping its website and nuclear newsletters, and is carrying out a readership and user survey among members. The Hungarian-Kazakh inter-governmental business council has signed an agreement to set up a working group on nuclear energy, the Hungarian finance minister said. The chair of a UK parliamentary committee has written to the minister for business and industry to call for clarity on a series of issues relating to the UK’s relationship with the EU and Euratom and the government’s plans for civil nuclear in the event of a “no deal” Brexit. 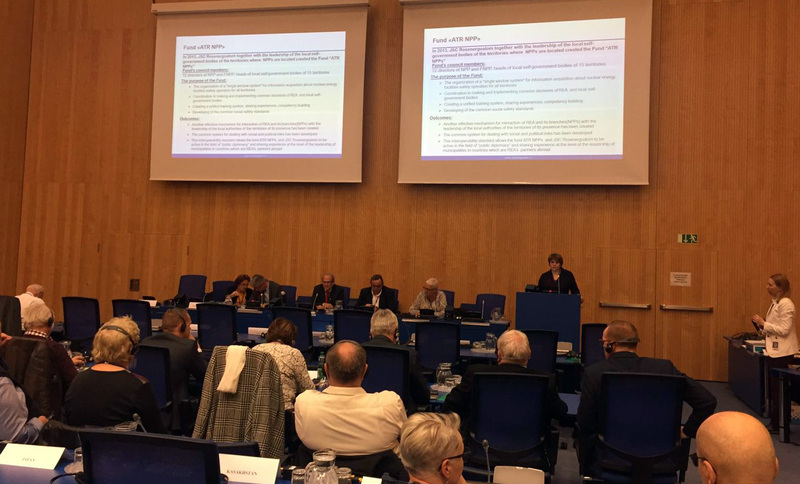 The International Atomic Energy Agency is responding to member state needs and making the Integrated Regulatory Review Service more effective and efficient, agency officials said in an interview with NucNet. The United Arab Emirates’ Federal Authority for Nuclear Regulation has signed a five-year agreement with the Spanish Nuclear Safety Council to exchange safety and regulatory-related information nuclear energy, safety assessment and research. Poland is reluctant to finance the construction of nuclear power stations with debt and hopes to continue talks about the project with the US, Piotr Naimski, the government official responsible for key energy infrastructure, told journalists in a briefing today. The World Bank is doubling its current five-year investments to around $200bn in support for countries to take ambitious climate action, a move the bank said represents significantly ramped up ambition and sends an important signal to the global community to do the same. The nuclear energy industry in Europe has welcomed the European Commission’s 2050 energy plan saying it is “delighted” that the EU recognises nuclear as a low-carbon source of electricity capable of reducing Europe’s dependence on fossil fuel imports and ensuring security of supply. The Netherlands will not be able to meet its emissions targets without reintroducing nuclear power, Klaas Dijkhoff, leader of the right-wing VVD party – the largest party in a ruling coalition – told current affairs show Nieuwsuur. It is vital that the UK government facilitates the build of new nuclear on the Moorside site in northwest England for the sake of the energy security of the UK and for the local economy in Cumbria, the body representing the country’s nuclear industry said. If Europe is serious about decarbonising its economy by 2050 then one quarter of the electricity produced in the EU will need to come from nuclear, although the cost of new nuclear will need to fall significantly if it is to be viable, a study commissioned by Brussels-based industry group Foratom said. Taiwanese voters decisively rejected the government’s phaseout of nuclear power, 59% to 41%. The European Commission published a new strategy document calling for the European Union to achieve net-zero greenhouse gas emissions by 2050, with nuclear playing a role in the effort. Decisions announced by president Emanuel Macron regarding the shutdown of nuclear power reactors will have no short-term consequences for Orano’s plants in France, although they may have an impact “towards the middle of the next decade”, the company said in a statement. The EPR nuclear power unit must be part of a package of technological options for tomorrow and France must maintain an industrial capacity to build new reactors, French president Emmanuel Macron said in his speech on the country’s energy programme yesterday. The European Commission has published a new strategy document calling for the European Union to achieve net-zero greenhouse gas emissions by 2050, with nuclear playing a role in the effort. French president Emmanuel Macron has said the country will move more slowly than promised to limit the amount of energy it derives from nuclear. A new administrative arrangement has been signed by the Canadian Nuclear Safety Commission (CNSC), the UK’s Department for Business, Energy and Industrial Strategy, and its Office for Nuclear Regulation. The balance of power in the European Union is shifting against nuclear energy with the loss of the UK through Brexit a further blow for the industry, Yves Desbazeille, director-general of the Brussels-based industry group Foratom, has said. Financing New Nuclear: Is RAB Model The Right Way Forward? The UK government has confirmed it is exploring the “right ways” to finance new nuclear, including through potential government investment in the Wylfa Newydd nuclear power station on the isle of Anglesey in North Wales and a regulated asset base, or RAB, model for future projects. Poland must invest in a new low-carbon energy source if it is to reduce its CO2 emissions with nuclear energy a potential solution to the challenges facing the Polish economy and the energy sector, Polish energy minister Krzysztof Tchórzewski told the inaugural World Nuclear Spotlight Poland conference in Warsaw today. Australia is committed to strengthening its regulatory framework for nuclear and radiation safety, but needs to make improvements including implementation of the framework in “a more consistent manner across the country”, an International Atomic Energy Agency team has said. Slovakia should clarify the ownership and financing structure of the new Bohunice nuclear power station project, which includes the role of the state, before a tendering process for construction begins, an International Energy Agency report released today concludes. The International Atomic Energy Agency has published two new safety guides that provide extensive recommendations and guidance to improve radiation protection of patients subjected to radiological procedures for diagnosis and treatment, and workers who are exposed to radiation in their jobs. Scientists at Culham’s materials research facility in the UK have completed a project to get a useful measure of the mechanical properties of materials subject to extreme environments such as those expected in a fusion reactor. France’s nuclear regulator ASN has approved the startup of a facility for radioactive waste near Narbonne in southern France. The United Arab Emirates’ commercial nuclear energy programme has been highlighted as a role model for nuclear energy development worldwide, having set “a new standard” for new nuclear construction. Voters in Arizona overwhelmingly rejected a constitutional amendment that would have required 50% of Arizona’s electricity to come from renewable sources by 2030, the Washington-based Nuclear Energy Institute said. South Korea’s state-controlled utility Korea Electric Power Corporation (Kepco) has said it intends to talk to the British government about plans to build a new nuclear power station at the Moorside nuclear site in Cumbria, northwest England. More than one-third of the United States’ nuclear power fleet will be or could be shuttered in the next decade before their operating licences expire and replaced primarily by natural gas and coal, according to a report by the Union of Concerned Scientists. It is vital that the UK government facilitates the build of new nuclear on the Moorside site in northwest England for the sake of the energy security of the UK and for the local economy in Cumbria, the body representing the country’s nuclear industry has said. The UK and Canada have signed a bilateral nuclear cooperation agreement (NCA) allowing nuclear energy collaboration to be continued after Brexit. The world’s leading climate scientists warned there is only a dozen years for global warming to be kept to a maximum of 1.5C, beyond which even half a degree will significantly worsen the risks of drought, floods, extreme heat and poverty for hundreds of millions of people. Europe risks losing much of its nuclear research capacity because of a “crisis in political vision” on energy issues and limited public funds, the European Atomic Energy Society said in a position paper. Taiwan’s electoral commission has approved a November 2018 referendum on the government’s existing policy to phase out commercial nuclear energy by 2025. A nuclear industry conference on 28 and 29 January 2019 in Prague, Czech Republic, will focus on nuclear power developments in the countries of Central and Eastern Europe, including new-build and long-term operation projects. Environmentalists and civil society groups will rally in Munich, Germany this Sunday to demand a halt to nuclear plant closures, which they say are increasing air pollution and locking-in fossil fuels. Any realistic plan for decarbonising the planet must include building 100 to 200 new nuclear reactors worldwide each year for the next few decades, experts have said in an article published in The Huffington Post. The UK remains on track to have all the international agreements that it requires to ensure uninterrupted cooperation and trade in the civil nuclear sector ready for Brexit at the end of March 2019, Greg Clark, the Secretary of State for Business, Energy and Industrial Strategy said in a written statement today. The report published today by the Intergovernmental Panel on Climate Change (IPCC) rightly concludes that nuclear power has a key role to play in fighting global warming and that renewables alone cannot solve the climate crisis, said Yves Desbazeille, director-general of the Brussels-based industry group Foratom. Many scenarios in today’s report by the UN Intergovernmental Panel on Climate Change (IPCC) foresee an increase in the use of nuclear power. The increase can be realised through existing mature nuclear technologies or new options such as Generation III and IV reactors, fast breeder reactors, new uranium and thorium fuel cycles, small reactors or nuclear cogeneration, the report said. On last October 4, a representative of AMAC met with Mr. José Domínguez Abascal, Secretary of State for Energy, in the Ministry for the Ecological Transition with the aim of presenting the association's point of view before the energy policy for closing nuclear power plants and the problems this can cause in the zones if they are not taken into account. AMAC emphasized the importance of working deeply in an economic development plan before each of the closures to provide the areas with real alternatives. The UK government has published an International Atomic Energy Agency Operational Safety Review Team (Osart) report from a mission carried out at the Torness nuclear power station in Scotland from 22 January to 8 February 2018. Senegal and France’s National Institute of Nuclear Science and Technology, or INSTN, have signed an agreement to collaborate on the establishment of a centre of excellence in nuclear science and technology. The World Association of Nuclear Operators today called on new entrants to the nuclear industry to engage with it earlier in the construction and commissioning process so they can benefit from maximum support for safe and reliable startup. Austria plans to appeal against a ruling by Europe’s second-highest court which rejected its objections to Britain’s plans for new nuclear power plants at Hinkley Point, the country’s sustainability minister said. Unless nuclear energy is meaningfully incorporated into the global mix of low-carbon energy technologies with the help of new government policies, the challenge of climate change will be much more difficult and costly to solve, a report by the Massachusetts Institute of Technology Energy Initiative said. The US House of Representatives has passed legislation aimed at accelerating the development of advanced nuclear reactors, Washington-based Nuclear Energy Institute said. There is a risk that Belgium will not be able to guarantee its energy supply following the phaseout of the country’s nuclear reactor fleet, with the deadline for the first shutdowns only four years away and no replacement capacity yet built, the Belgian Nuclear Forum told NucNet. A significant increase of all clean, low-carbon technologies such as nuclear power is needed if climate change targets set under the Paris Agreement to the United Nations Framework Convention on Climate Change are to be met, the International Atomic Energy Agency said in a report. Critical areas of nuclear safety research are underfunded and education programmes relating to radiation safety are in jeopardy, the Swedish Radiation Safety Authority (SSM) has concluded in a study for the government. The UK Nuclear Decommissioning Authority and the Japan Atomic Energy Agency are to share expertise in nuclear decommissioning and radioactive waste management. The US Department of Energy has announced the finalisation of an action plan with the UK to ensure nuclear energy’s contribution to both countries’ energy resources, low-carbon emissions targets, non-proliferation goals, and nuclear energy safety objectives. France’s state-controlled utility and nuclear operator EDF needs to show a new generation of nuclear reactors work well, which is not for now the case, new environment minister Francois de Rugy said in remarks published in Le Monde yesterday. The UK’s Nuclear Decommissioning Authority needs to be scrapped as it currently exists and a nuclear development agency created to make sure the Moorside nuclear power station in west Cumbria, England, goes ahead, energy union GMB said on 10 September 2018. French nuclear group Orano has inaugurated a €1.15bn uranium conversion plant at its Tricastin site in southern France. Nuclear energy’s electricity generating capacity risks shrinking in the coming decades as ageing reactors are retired and the industry struggles with reduced competitiveness, according to a new International Atomic Energy Agency report. A bipartisan group of senators has introduced legislation designed to help the US regain its lead in nuclear energy technology in the face of increasing global competition, the Washington-based Nuclear Energy Institute said. The nuclear industry must defend itself against the growing risk of cyberattack by investing in the continuous improvement of cybersecurity measures at all nuclear facilities and building “mutual assistance mechanisms and shared resources” for responding to cyberattacks, a report by the Washington-based Nuclear Threat Initiative says. Poland will not meet European Union carbon emissions targets unless it builds a nuclear power station, energy minister Krzysztof Tchorzewski said on 6 September 2018. A study by the Massachusetts Institute of Technology’s Energy Initiative proves that “deep decarbonisation” will be extremely difficult without the use of nuclear energy, the director-general of Foratom, the trade association for the nuclear energy industry in Europe, said today. China is officially aiming for 58 GW of installed nuclear capacity by 2020 – up from almost 36 GW today – but the country’s nuclear sector faces a number of challenges and this target is likely to be missed, Shanghai-based energy research company Nicobar told NucNet. A “secret” report commissioned last spring by France’s government proposed building five new nuclear reactors, Les Echos reported on 30 August 2018, two days after anti-nuclear environment minister Nicolas Hulot resigned and said that progress on a shift to renewable energy was too slow. A Nordic-Russian emergency preparedness exercise for a nuclear incident to be held in Sweden in 2019 will be the first such exercise involving joint activities, Sweden’s regulator said. Australia’s federal government confirmed that increased community benefits of up to AUD 31 million (€19.8m) will be available to the community chosen as the site of a national radioactive waste management facility. Private finance will not come forward to develop first-of-a-kind small nuclear projects without government support similar to that offered in the past for wind and solar, an independent finance working group appointed by the government concluded. If the UK and the EU fail to reach an agreement on Brexit terms, the UK will no longer be a member of the Euratom R&T programme, no longer be a member of Fusion for Energy, and will no longer be able to collaborate on the International Thermonuclear Experimental Reactor (Iter) project through the EU, the government said. Australia’s Human Rights Commission has been asked to decide whether an Aboriginal group should have a say on the location of a proposed radioactive waste facility in South Australia. Plans to expand the South Africa’s nuclear power capacity by building up to 9,600 MW of new nuclear plants have been put on hold at least until 2030, the government has announced. Swiss nuclear power stations have an adequate level of protection against a deliberate plane crash incident, according to a study commissioned by the Swiss Federal Nuclear Safety Inspectorate (ENSI). In the event of the UK and the EU failing to reach agreement on Brexit, the UK’s departure from the EU would mean UK organisations might be unable to access funding for Horizon 2020 projects after exit day in March 2019, the government said today. If the UK and the EU fail to reach an agreement on Brexit terms, the UK will no longer be a member of the Euratom R&T programme, no longer be a member of Fusion for Energy, and will no longer be able to collaborate on the International Thermonuclear Experimental Reactor (Iter) project through the EU, the government said today. Slovenske elektrarne has successfully completed cold testing at Unit 3 of the Mochovce nuclear power station under construction in western Slovakia, the company said in a statement on 23 August 2018. Russia’s Leningrad-1 nuclear power plant, which began commercial operation in November 1974, will be shut down permanently in December 2018, the Interfax news agency said, quoting station director Vladimir Pereguda. Sweden’s nuclear energy regulator SSM has asked plant operators to provide it with information about how their reactors were affected by the recent prolonged period of unusually warm weather, a statement said. China could be planning to power disputed islands in the South China Sea using floating nuclear plants, the US Department of Defence said in a report to Congress. A nuclear power plant digitalisation conference on 28 and 29 November 2018 in Charlotte, North Carolina, will focus on how nuclear operators can use digital innovation to improve plant operation and maintenance. South Korea, whose government is planning to reduce the proportion of nuclear power in the country’s energy mix, is “one of the world’s leading energy importers” and relies on imports to meet about 98% of its fossil fuel consumption as a result of insufficient domestic resources, a report by the US Energy Information Administration says. The South Korean ministry of trade, industry and energy has held a meeting with two state utility firms –Korea Electric Power Corporation and Korea Hydro and Nuclear Power – and other nuclear trade organisations to establish a strategy to secure a deal for Saudi Arabia's first nuclear power project, according to unconfirmed reports by the Yonhap news agency. Seven out of 10 South Koreans want the country to continue using nuclear energy to generate electricity, according to a survey by the Korean Nuclear Society. A Nordic-Russian emergency preparedness exercise for a nuclear incident to be held in Sweden in 2019 will be the first such exercise involving joint activities, Sweden’s regulator has said. A long-pending update of Poland’s nuclear power programme is expected to be approved by the Polish cabinet by the end of 2018, according to comments by Tadeusz Skobel, a deputy energy minister. Australia’s federal government has confirmed that increased community benefits of up to AUD 31 million (€19.8m) will be available to the community chosen as the site of a national radioactive waste management facility. India’s installed nuclear power capacity is expected to rise from 6,780 MW to 22,480 MW by 2031, an increase of 15,700 MW (gross), the department of atomic energy told parliament. Five US governors have released a statement highlighting the benefits of nuclear energy for their region and calling for a serious evaluation of plans to properly value secure, clean energy sources such as nuclear. The first batch of nuclear fuel is expected to be delivered in November 2018 to the Belarusian nuclear power station under construction near the town of Ostrovets, Belarusian state news agency Belta said. A nuclear decommissioning and used fuel conference on 1 and 2 October 2018 in Charlotte, North Carolina, will focus on pressing issues facing the back end of the nuclear lifecycle. The UK fully supports plans to extend Euratom’s research and training programme and remains financially committed to it despite Brexit, the government said in a paper on the country’s participation in the EU’s Horizon 2020 research and innovation project. Turkey will build a third nuclear power station in the Thrace region northwest of Istanbul, and will cooperate with China on the project, energy minister Fatih Donmez was reported as saying. The UK’s National Skills Academy for Nuclear (NSAN) has announced a series of cyber and information security courses based in a “cyber Lab” at events company Energus’ headquarters in Workington, northwest England. Private finance will not come forward to develop first-of-a-kind small nuclear projects without government support similar to that offered in the past for wind and solar, an independent finance working group appointed by the government has concluded. Small modular reactors should be offered the same subsidies as those provided to offshore wind, an independent finance working group appointed by the government has concluded, according to the Financial Times. The International Atomic Energy Agency has published a guide showing how operators of nuclear installations can learn from experience to reduce the likelihood of events that could compromise safety. Installation has been completed of the main equipment for the turbine of the Leningrad 2-2 nuclear power plant in Sosovny Bor, northwest Russia, state nuclear corporation Rosatom said. The few new nuclear reactors that are under construction in the US and Europe have been plagued by cost and timetable overruns, and parts of the industry are in financial difficulty. Yet without new build, the retirement of existing nuclear stations threatens a significant step backwards for low-carbon energy, a briefing paper by researchers at Imperial College London said. Without new nuclear power plants the retirement of existing reactors threatens a significant step backwards for low-carbon energy, a briefing paper by researchers at Imperial College London said. Unions in the UK have called for clarity on the future of the Moorside nuclear station project in Cumbria, northwest England, and are seeking an urgent meeting with business secretary Greg Clark to “chart a speedy way forward, including the commitment of public money”. Legislation passed by the US Congress this week calls for the Department of Energy to prepare a report on a pilot programme for deploying micro-reactors at national security facilities. The International Atomic Energy Agency has published a new safety guide designed to help countries build strong radiation safety infrastructure. A deep geological disposal facility for nuclear waste could be built in the UK under national parks and areas of outstanding natural beauty because it is right for safety matters to prevail over environmental concerns, a parliamentary committee has concluded. Planning has begun for a joint Nordic-Russian emergency preparedness exercise for a nuclear incident to be held in Sweden in 2019, Sweden’s regulator has said. The nuclear energy industry is coming to realise that digitalisation is paramount, but the challenge is to make sure digital technology is sustainable over the lifetime of a plant – and that human knowledge is captured as the first generation of workers retires. A nuclear pact between Japan and the US has been automatically extended, allowing Tokyo to continue to reprocess spent nuclear fuel, extract plutonium and enrich uranium. An agreement between the International Atomic Energy Agency and the Spanish Guardia Civil law enforcement agency sets out to strengthen nuclear security with a focus on Spanish-speaking countries, the IAEA said today. The construction of two additional nuclear power units at the existing Paks nuclear power station site in Hungary will begin by October 2019 at the latest, despite an Austrian attempt to have the project blocked, Russian state operated news agency RIA Novosti reported. Global investment in nuclear power declined by nearly 45% to $17bn in 2017 due to a 70% fall in spending on new plants coming online during the year to $9 billion, which more than offset an increase in spending on existing plants, a report published today by the International Energy Agency says. Uzbekistan has identified 10 possible sites for its first commercial nuclear power station, but the favourite is in the Navoiy region in the north of the country, press reports have said. Europe’s second highest court has rejected Austrian objections to the planned Hinkley Point C nuclear station in southwest England, saying British government aid offered to the project did not violate EU rules. Turkey has created a new state agency to regulate nuclear energy sector, local media reports have said. Nuclear power holds the potential to make a significant contribution to decarbonising the US energy system, but whether it could do so in its current form is a critical question, a report by researchers at Carnegie Mellon University’s Department of Engineering and Public Policy says. In the face of rising electricity demand, US energy secretary Rick Perry has confirmed that work is underway on a plan to preserve some of the nation’s key nuclear power plants. Austria should consider reorganising its “fragmented” system of several federal regulatory authorities into a simpler structure that would allow for more effective use of available resources, an International Atomic Energy Agency Integrated Regulatory Review Service (IRRS) team has said. EU regulators have concluded that the Belarusian nuclear power station under construction near the town of Ostrovets complies with the bloc’s risk and safety assessments – so-called “stress tests” – but made a number of recommendations to the national regulator. The UK’s Nuclear Decommissioning Authority has finalised roadmaps to collaborate in nuclear decommissioning with French state-controlled companies EDF and Orano. Nuclear reactor restarts in Japan have become more likely after the government approved an energy plan today confirming that nuclear power will remain a key component of Japan’s energy strategy. The UK’s new nuclear safeguards legislation was this week given Royal Assent, which means it has become one of the first pieces of legislation addressing the country’s departure from the European Union to complete its passage through parliament. Bulgaria’s cabinet annulled on 27 June 2018 a 2012 government decision which terminated the construction of the Belene nuclear power station project, local media reported. A new organisation called the Atomic Energy Association (Atena) will be established in Japan on 1 July 2018 in an effort to improve dialogue with the regulator and achieve “substantive safety improvements”, the lobby group Japan Atomic Industrial Forum (Jaif) said. Identified uranium resources are sufficient for well over 100 years of supply, but the current oversupply may not last for ever and it is important that this “vital resource” is mined, produced and managed sustainably, International Atomic Energy Agency director-general Yukiya Amano told the opening of a meeting on the uranium production cycle today. A full-scale in-situ system test for spent nuclear fuel disposal is expected to begin this week at Posiva’s planned final deep geologic disposal facility at Olkiluoto, Finland. Luxembourg is committed to strengthening its regulatory framework for radiation safety, but needs to increase the independence of its regulatory body, an International Atomic Energy Agency team of experts said. Brussels has not been “nuclear-positive” in recent years, but if Europe is serious about taking carbon out of its energy consumption, then nuclear energy needs to be part of the solution together with renewables, Orano chief executive Philippe Knoche said in an interview with Politico. More than 80% of residents of the United Arab Emirates are in favour of using nuclear energy to generate electricity with 91% saying nuclear energy is important for the nation, according to a national poll. Turkey’s president Recep Tayyip Erdoğan has appeared to confirm that the country is going ahead with plans to build a third nuclear power station. European Union energy policy makers should recognise and reward the long-term operation (LTO) of nuclear reactor units because of their role in meeting the EU’s climate goals, Brussels-based nuclear industry group Foratom said. Turkey’s main opposition party, the Republican People's Party (CHP), has pledged in its election bid to cancel the Akkuyu and Sinop nuclear power station projects, reports in Turkish media said. The premature shutdown of nuclear power units in France would jeopardise the country’s energy security and hamper efforts to reduce carbon emissions, Valérie Faudon, head of the French Nuclear Energy Society (SFEN) told NucNet. French nuclear regulator ASN has decided to strengthen its oversight of the production process of nuclear equipment and components as a result of the series of manufacturing irregularities, which were detected in 2015 at the Le Creusot forge in central France. Eletrobras Eletronuclear, Brazil’s state-run nuclear operator, and French state-controlled nuclear operator EDF have signed an agreement to cooperate in the promotion of nuclear energy. Jordan has scrapped a $10bn (€8.5bn) deal with Russia to build the Middle Eastern kingdom’s first nuclear power station, reports in local media said today. Japan’s Nuclear Regulatory Authority (NRA) has approved the test operation mode for the Genkai-4 nuclear reactor unit in the southern Saga Prefecture, operator Kyushu Electric Power Company said. Russia and China have signed two deals for the construction of four Generation III+ VVER-1200 units at the Xudabao and Tianwan sites during Russian president Vladimir Putin’s official visit to Beijing on 8 June 2018, said a statement by Russian state nuclear corporation Rosatom. Nuclear seems to be the “elephant in the room” for many decision makers at EU level, Yves Desbazeille, director-general of Brussels-based industry group Foratom, told a nuclear conference in Varna , Bulgaria. The Swiss Federal Nuclear Safety Inspectorate (ENSI) intensified its research efforts in 2017 in the field of nuclear safety and radioactive waste management, the organisation said in a statement. The US government is making plans to take “necessary actions” to stop the premature retirement of “fuel-secure” generation capacities, including nuclear and coal power stations, Bloomberg reported quoting a leaked Department of Energy (DOE) draft memo. The UK government has started negotiations with Japan-based Hitachi on the planned £20bn Wylfa Newydd nuclear power station in Wales, energy secretary Greg Clark said in a written statement to parliament yesterday. The Jordan Atomic Energy Commission (JAEC) and state-owned China National Nuclear Corporation (CNNC) have signed an agreement to cooperate on the development of uranium resources, a statement by the Chinese company said. The German government would like to see neighboring countries follow Germany’s example and phase out “old” nuclear power stations, federal environment minister Svenja Schulze was quoted as saying in a statement on the ministry’s official webpage. The Bulgarian government is expecting a parliamentary decision on the potential revival of the Belene nuclear power station project to be taken by “the end of this week”, energy minister Temenuzhka Petkova told local media. The UK’s nuclear safety and security regulator has awarded the contract for delivery of a new IT system necessary for it to establish a domestic safeguards regime after the UK’s withdrawal from the Euratom Treaty. Greenhouse gas emissions in France have increased for the second consecutive year, underlining the need to devote significant efforts to decarbonising transport and housing and for keeping nuclear energy as an essential part of the country’s energy mix, the French Nuclear Energy Society (SFEN) said, quoting statistics from the Ministry of the Environment. Japan’s government is committed to nuclear power accounting for at least one-fifth of the nation’s electricity supply in fiscal year 2030, calling it an “important baseload energy source”, according to a draft proposal. China is on course to lead the world in the deployment of nuclear power technology by 2030 and should it succeed will assume global leadership in nuclear technology development, industrial capacity, and nuclear energy governance, a report said. Bulgaria’s government submitted a formal proposal to parliament to revive the Belene nuclear power station project, abandoned in 2012 because of concerns over its financial viability. Nuclear energy provides almost one-third of the EU’s electricity, but there is a real danger that policymakers are ignoring its attributes as a reliable, low-carbon energy source that can work alongside renewables, said Yves Desbazeille, director-general of industry group Foratom. Significant progress has been made between the European Union and Iran since the signing of the Joint Comprehensive Plan of Action (JCPOA) in 2016, a joint statement said. The UK’s nuclear energy industry welcomed confirmation by prime minister Theresa May that the government intends to seek associate status to Euratom R&D programmes. Nuclear regulator ASN has identified a number of key research topics in nuclear safety and radiation protection it believes France should focus on in the coming years. Nuclear power must be part of Spain’s planned transition to low-carbon energy sources because it operates the highest number of hours, produces the most electricity and helps the most to avoid polluting emissions, the Madrid based industry group Foro Nuclear said today. The Polish energy ministry has adopted a long-pending update of the country’s nuclear power programme and the document is expected to be forwarded to the cabinet within two months, Jozef Sobolewski, director of the ministry’s nuclear energy department, told reporters. If the world is serious about reducing emissions and improving economies, governments must consider all options when it comes to carbon-free power, including clean, reliable nuclear energy, Dan Brouillette, deputy secretary of the US Department of Energy, said. Russia’s first commercial floating nuclear power station, the Akademik Lomonosov, has arrived in the port city of Murmansk in the far northwest of Russia where it will be loaded with nuclear fuel, state nuclear corporation Rosatom said. The Czech government has postponed a decision on building new nuclear units, saying it needed more time to evaluate the impact on its budget and find out EU views on state aid for such a project, reports said today. Bulgaria’s government has submitted a formal proposal to parliament to revive the Belene nuclear power station project, abandoned in 2012 because of concerns over its financial viability. Russia and Sudan have signed an agreement to cooperate on education and training as the African country lays the groundwork for a possible move into commercial nuclear energy generation. Russia and Zambia have signed a general contract for the construction of a centre for nuclear science and technology in the African country that will include a research reactor and nuclear medicine facility. Nuclear energy provides almost one-third of the EU’s electricity, but there is a real danger that policymakers are ignoring its attributes as a reliable, low-carbon energy source that can work alongside renewables, says Yves Desbazeille, director-general of industry group Foratom. China is on course to lead the world in the deployment of nuclear power technology by 2030 and should it succeed, China will assume global leadership in nuclear technology development, industrial capacity, and nuclear energy governance, a report says. Key conditions for developing the nuclear industry include public acceptance and a high level of safety, with operators of nuclear power plants ultimately responsible for safety, the chairman of the World Association of Nuclear Operators (WANO) said today. State-owned China National Nuclear Corporation (CNNC) has confirmed its interest in investing in Bulgaria’s stalled two-unit Belene nuclear power project, a statement by the Bulgarian energy ministry said. The Tennessee Valley Authority (TVA) has completed a multi-year series of major construction works to protect the Sequoyah and Watts Bar nuclear stations in Tennessee from the most extreme of weather events. Renewable and nuclear energy are both essential for Japan to benefit from an inexpensive, stable supply of electricity while tackling global warming, Japan Atomic Industrial Forum chairman Takashi Imai told the industry group’s annual conference in Tokyo. The US and Mexico have signed an agreement to cooperate in the peaceful uses of nuclear energy, the Mexican foreign ministry said in a statement. European Union energy policy should take account of the flexibility nuclear power could provide alongside intermittent renewables for the bloc’s electricity system, the Brussels-based nuclear industry group Foratom has said. The ENWD -GMF meeting was held in Dessel on the 11th and 12th of April. 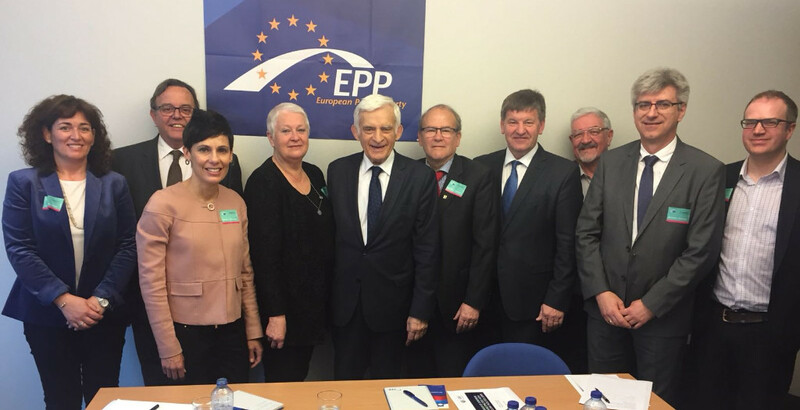 On the occasion of the meeting, on April 11 there were two meetings in the European Parliament attended by both the GMF Presidium and the members of the United Kingdom with the aim of working on the development of European energy policies. The first meeting was with Mr. Jerzy Buzek, Chairman of the Chair of ITRE Committee, in which, in addition to deepening on energy policy issues, the GMF members emphasized the importance of giving value to the local world in the decision-making process in the matter of nuclear energy. The meeting was then held with Mr. Johannes Luchner, Directorate General for European Civil Protection and Humanitarian Aid Operations (ECHO)- Unit A “Emergency Preparedness and Security”, with the aim of working on the development and improvement of nuclear emergency plans. At the end, the participants of the ENWD-GMF went to Dessel, where Kris Van Dijck, Mayor of Dessel, gave them an introduction to the municipality and the projects that take place there. On April 12, the technical visit to SCK·CEN (Nuclear Studie Center in Mol on the border with Dessel) began with a presentation of the Myrrha project by its Director, Mr. Hamid Aït Abderrahim. Participants to the technical visit to SCK·CEN. The International Atomic Energy Agency has begun work on a new guidance document on calculating the costs of new nuclear plants. Nuclear energy could have a 15% share of the global energy mix by 2040 – an increase of around 5% – with power generation “all but decarbonised” and renewables providing more than 60% of supply, says a new report from five international agencies. There is strong evidence from projects outside Europe and the US that cost reductions of around 35% can be made to nuclear new build projects in the UK, a new report says. The Belgian government approved a new energy strategy that will see the country phase out its fleet of seven commercial nuclear plants between 2022 and 2025. There is strong evidence from projects outside Europe and the US that cost reductions of around 35% can be made to nuclear new build projects in the UK, a report published today says. The sharing of both regulatory and operating experience is crucial for the improvement of nuclear safety practices in the nuclear industry, although additional steps are needed to improve the sharing of regulatory experience, the International Atomic Energy Agency has said. Chernobyl’s New Safe Confinement (NSC) shelter, designed to enclose a previous makeshift shelter that was hastily assembled immediately after the 1986 accident, will begin full operation in December, Ukrainian president Petro Poroshenko said. About 210 tonnes of agricultural products produced in the Japanese prefecture of Fukushima were exported in fiscal year 2017, the largest volume since FY05, when the prefecture began compiling statistics, the Tokyo-based Japan Atomic Industrial Forum said. China is fast-tracking the development of Generation III and III+ nuclear power plants, a situation that reflects the “sheer size” of state players that have abundant capital and the ability to absorb risks, the China Nuclear Energy Association (CNEA) said in a report published on 23 April 2018. Bulgaria’s energy ministry was recently asked by the country’s parliament to present by the end of June 2018 a number of concrete options for the realisation of the two-unit Belene nuclear power station – a project that dates back almost 40 years, on which Bulgaria is already said to have spent €1.5bn, and which was formally abandoned in 2012 largely over uncertainties about how to finance it. New, large-scale nuclear plants are not viable in today’s US competitive markets, where even existing nuclear plants are challenged due to the failure of these markets to value resiliency and environmental benefits, nuclear operator Exelon Corporation said on 19 April 2018. Japan must define long-term policies to take advantage of the benefits of nuclear energy, particularly related to the slowing down of global warming, the chairman of the Japan Atomic Energy Commission, Yoshiaka Oka said on 19 April 2018. Uzbekistan expects this year to sign an agreement with Russia on the construction of a nuclear power station, Uzbek president Shavkat Mirziyoyev said, according to Russian state nuclear corporation Rosatom. A second meeting of a commission set up to investigate increased concentrations of the radioactive isotope ruthenium-106 (Ru-106) in the atmosphere in Europe and Russia last year has been unable to confirm a source of the emissions, the Swedish Radiation Safety Authority (SSM) said today. Faced with the potential closure of the Hope Creek and Salem nuclear power stations, the New Jersey Senate and Assembly passed bills to compensate the facilities for producing carbon-free electricity, he Washington-based Nuclear Energy Institute said. The price of electricity in today’s markets does not accurately reflect the cost of electricity on society and the environment, and as a result, decisions regarding supply and future planning fail to include all of the factors needed to ensure reliable electricity supply, a report by the Nuclear Energy Agency says. A poll in Russia has shown that almost three in four Russians have a favourable opinion of nuclear power, said Russian state-owned nuclear corporation Rosatom. Russia is planning to commission 13 nuclear power plants by 2024, in addition to the five that are already under construction, the director-general of state nuclear operator Rosenergoatom Andrei Petrov said. Nuclear facilities in Lithuania operated safely during 2017 with no serious process failures in either operation or decommissioning, the country’s regulator said on 9 April 2018. A think-tank report which concluded the US nuclear industry is facing a crisis shows the need for the administration and Congress to support American commercial nuclear exports through concrete action, the Washington-based Nuclear Energy Industry said. The company building the Barakah nuclear power station in the United Arab Emirates has signed three agreements with South Korean companies, expanding cooperation in the nuclear energy industry between the UAE and the Asian country. Russian ambassador to the Philippines Igor Khovaev said the abandoned Bataan nuclear power station project north of Manila is beyond revival, CNN Philippines reported. The Belgian government has approved a new energy strategy that will see the country phase out its fleet of seven commercial nuclear plants between 2022 and 2025. French state-controlled power group EDF signed an industrial agreement with the Nuclear Power Corporation of India Ltd (NPCIL) for the eventual deployment of six EPR units at the Jaitapur site in western India. The UK has made good progress in negotiations for new safeguards agreements with the International Atomic Energy Agency to replace existing agreements between UK, the IAEA and Euratom following the UKs departure from the European Union, the government said. Japan’s Ministry of Economy, Trade and Industry has approved expert committee conclusions calling for nuclear energy to make up 20% to 22% of Japan’s energy mix until fiscal year 2030 in the next revision of the country's basic energy plan, local media reported. The UK has made good progress in negotiations for new safeguards agreements with the International Atomic Energy Agency to replace existing agreements between UK, the IAEA and Euratom following the UKs departure from the European Union, the government said in a statement on 26 March 2018. The nuclear security regime in France is robust and well-established, and incorporates the fundamental principles of the amended Amendment to the Convention on the Physical Protection of Nuclear Material, an International Atomic Energy Agency team said. The UK government has been defeated twice in the House of Lords over its plans for nuclear cooperation with the EU after Brexit. Poland has drawn up ambitious plans to build up to 6 GW of nuclear generating capacity, potentially at two sites, by the late 2030s or early 2040s. But the government is yet to take a final decision and the deadline has pushed back several times, with plans hampered by changes in government, problems putting in place the right domestic legislation and the need to find the right financing model. A six-member International Atomic Energy Agency-led team spent five days in Panama assessing occupational radiation protection at industrial and medical facilities against recommendations in IAEA safety standards. Nuclear energy is an area of increased interest to Sri Lanka and the inclusion of nuclear power as a possible option for electricity generation by 2030 is a key element in the country’s long-term generation expansion plan until 2034, the International Atomic Energy Agency said on 20 March 2018. Ecuador is making efforts towards improving its nuclear security regime against the theft, sabotage or unauthorised use of nuclear material, an International Atomic Energy Agency team of experts said after completing a nuclear security advisory mission to the country. The US Nuclear Regulatory Commission said on 16 March 2018 that Russian cyberattacks aimed at the US power grid last year did not compromise operations at any nuclear power plants. State-owned China National Nuclear Corp (CNNC) has expressed an interest in investing in Bulgaria’s stalled two-unit Belene nuclear power project, energy minister Temenuzhka Petkova said on 16 March 2018. US-based Westinghouse Electric Company has completed a decommissioning project at the Barseback nuclear power station in Sweden that included the underwater segmentation and packaging of the reactor vessel internals. The UK’s nuclear regulator has identified five key areas of supply chain management where improvements are needed ahead of acceleration in both construction and manufacturing for the Hinkley Point C EPR project in Somerset, England. The International Nuclear Energy Agency has released its annual edition of the Country Nuclear Power Profiles (CNPP), documenting the status and development of nuclear power programmes worldwide as of the end of 2017. The Massachusetts Institute of Technology (MIT) has announced plans to work with a newly formed private company, Commonwealth Fusion Systems (CFS), to realise the promise of fusion as a source of unlimited, safe, carbon-free energy. Zach Hartwig, an assistant professor of nuclear science and engineering, is one of MIT’s leads on the project, along with others in MIT’s Plasma Fusion and Science Centre. He spoke about the group’s vision for a fusion-powered future. Significant progresses has been made with the remediation of off-site areas around the Fukushima-Daiichi nuclear power station with decontamination activities playing an important role in the reduction of air dose rates, a series of meetings between the International Atomic Energy Agency and Japan’s Ministry of the Environment was told. The dream of nuclear fusion is on the brink of being realised, according to a new US initiative that says it will put fusion power on the grid within 15 years. The government has made substantial progress in talks with key international partners to have new bilateral nuclear cooperation agreements and ensure that arrangements are in place for continuity for the nuclear sector when the UK leaves Euratom, the minister for business and energy has said. A report made public today by IRSN, the technical arm of French nuclear regulator ASN, shows there were 233 significant events in civil nuclear facilities reported to ASN in 2015 and 218 reported in 2016. The report is published every two years. India is planning a tenfold increase in uranium production over the next 15 years as it implements plans to increase its nuclear share of electricity production from around 3% today to 25% in 2050, minister of state Jitendra Singh told the country’s parliament in a written statement on 7 March 2018. The use of nuclear substances in Canada is safe and licensees have made adequate provisions for the protection of the health, safety and security of people and the environment, an annual report by the regulator says. Luxembourg is supporting Austria in its legal challenge against the European Commission over a planned expansion to the Paks nuclear power station in Hungary, the environment ministers of both countries announced on 5 March 2018. Georgia has made significant progress in strengthening its regulatory framework for nuclear and radiation safety, but faces challenges in the coming years including the need to develop competencies for safety professionals, separate the roles of the regulatory body and the operator of radioactive waste facilities, and define a plan for radioactive waste disposal, an International Atomic Energy Agency (IAEA) team of experts said. Enresa, Spain’s national agency in charge of radioactive waste management and the decommissioning of nuclear sites, is to use drones for the first time in Spain for measuring radioactivity during the dismantling of the José Cabrera-1 nuclear reactor unit, Spanish industry group Foro Nuclear said. MEPs in the European Parliament’s energy committee backed key reforms to the European internal electricity market including stricter rules for capacity mechanisms that have been used to keep power stations on standby for use in emergencies – including to fill potential gaps in nuclear baseload generation. Austria filed a legal complaint against the European Commission with the European Court of Justice in Luxembourg for allowing Hungary to expand its Paks nuclear power station. Brussels-based nuclear industry group Foratom has welcomed reforms to the EU Emissions Trading System (ETS) for its next phase from 2021 to 2030, but said more should be done if the EU wants to restore confidence in the system as its main method of decarbonising the economy in an affordable way. Austria has filed a legal complaint against the European Commission with the European Court of Justice in Luxembourg for allowing Hungary to expand its Paks nuclear power station. The UK nuclear industry has welcomed comments in a speech by opposition Labour Party leader Jeremy Corbyn that after Brexit he would want the country to remain a member of Euratom, the treaty which governs the use of nuclear energy and nuclear materials in the EU. China is set to more than triple its nuclear energy capacity over the next 20 years, overtaking the US to become the world’s largest nuclear power producer, according to the International Energy Agency. MEPs in the European Parliament’s energy committee today backed key reforms to the European internal electricity market including stricter rules for capacity mechanisms that have been used to keep power stations on standby for use in emergencies – including to fill potential gaps in nuclear baseload generation. The International Atomic Energy Agency is launching an effort to expand international cooperation and coordination in the design, development and deployment of small, medium sized or modular reactors (SMRs), which are among “the most promising emerging technologies in nuclear power”, the agency said on 16 February 2017. The US Nuclear Regulatory Commission has published its updated strategic plan for fiscal years 2018-2022. The US Congress has passed a budget bill that extends the nuclear production tax-credit (PTC), which will apply to new nuclear power plants coming into service after 31 December 2020, Washington-based Nuclear Energy Institute (NEI) said. The US nuclear power industry is “at crossroads” and urgently needs “tangible signals” from Congress that it values nuclear power, Maria Korsnick, president and chief executive officer of the Washington-based Nuclear Energy Institute, told a committee of House lawmakers yesterday. US government and private-sector nuclear energy officials will discuss the future of the industry with House lawmakers this week. An international commission established by Russia to investigate high levels of the radioactive substance ruthenium-106 (Ru-106) in several European countries in the autumn of 2017, has held its first meeting, the Swedish radiation safety authority SSM said on 5 February 2018. A study funded by the US Department of Energy recommends that federal agencies such as the DOE and the Defence Department be allowed to enter into 30-year power purchase agreements with utility operators of small modular reactors (SMRs). France has demonstrated “a comprehensive commitment” to nuclear safety with a responsible approach to the management of radioactive waste and spent nuclear fuel, an International Atomic Energy Agency (IAEA) team of experts said. Nuclear energy contributes to the European Union’s three key energy objectives laid out in the bloc’s energy union initiative of security of supply, competitiveness and environmental sustainability, Yves Desbazeille, director-general of industry group Foratom, told journalists in Brussels on 29 January 2018. The UK government should put in place a “monitoring and contingency scheme” to identify risks relating to the delivery of new nuclear stations and, in the event that new-build is delayed, allow for additional low-carbon generation to be contracted, a Committee on Climate Change report said. Significant challenges remain to be overcome for the UK’s civilian nuclear power industry, including the remediation of high-hazard facilities at the Sellafield nuclear site and decommissioning the country’s fleet of shutdown Magnox nuclear power plants, a government report said. The UK is aiming for continuity with existing Euratom arrangements and wants to include Euratom in any implementation period agreed as part of wider discussions on Brexit, energy secretary Greg Clark said in a written statement to parliament. Austria announced that it plans to sue the European Commission at the European Court of Justice in Luxembourg for allowing Hungary to expand its Paks nuclear power station. IRSN, the technical arm of French nuclear regulator ASN, has published reports in French and English on digital instrumentation and control (I&C) in nuclear plants, and accident situations in water-cooled nuclear plants. The UK must look to maintain the post-Brexit viability of the Joint European Torus (JET) and ensure that the country is able to participate in the International Thermonuclear Experimental Reactor (ITER) despite its withdrawal from Euratom, a report published today says. The Euratom Treaty is vital to the functioning of nuclear energy generation in the UK and failure to replace its provisions by the point of Brexit could result in the UK being unable to import nuclear materials, and have severe consequences for the UK’s energy security, says a parliamentary report published today. The UK’s ability to build future nuclear power stations, including Hinkley Point C in Somerset, is in doubt if access to specialist EU workers is curtailed, warns a parliamentary report on Brexit published today. A House of Lords committee has called on the UK government to report to Parliament on the possibility of a Euratom-specific transition period separate from the wider Brexit process. Sweden’s Land and Environment Court has told the government that plans for a deep geologic repository for spent nuclear fuel should only be allowed to go ahead if “remaining uncertainties” about copper disposal canisters are investigated. Communities around England, Wales and Northern Ireland will be offered £1m a year to volunteer to host a deep geologic disposal facility for thousands of years, as part of a revised government programme. Contributions to the International Atomic Energy Agency’s nuclear laboratory renovation project totalled €8.7m ($10.7m) in 2017, allowing work to “advance significantly”, the agency said. The Nuclear Option: Can This Be Africa’s Energy Future? Uranium first left Africa’s shores for wealthier nations in the 1940s, when the US shipped 30,000 tonnes of it from the Shinkolobwe mine in Katanga province in the Democratic Republic of Congo to be used in the first atomic bombs. In return, the US helped the DRC build Africa’s first nuclear reactor – a research unit at the University of Kinshasa – in 1958. The Swedish Radiation Safety Authority, or SSM, said today it has recommended the approval of plans to build an encapsulation facility and a final repository for spent nuclear fuel. The Polish government is “quite close” to finalising the financial model to be used for the construction of the country’s first nuclear power station, energy minister Krzysztof Tchórzewski was quoted by the state-owned Polish Press Agency (PAP) as saying. The US nuclear industry faces “a watershed year” as it fights to keep existing nuclear power plants open, completes plans to build new ones and helps pave the way for the introduction of advanced reactor technology, a Nuclear Energy Institute official said. The nuclear industry should examine what can be learnt from toxic disasters so it can improve the way it deals with the mental health consequences of a nuclear incident, a report by the Organisation for Economic Cooperation and Development’s Nuclear Energy Agency says. The UK’s nuclear industry has welcomed a government commitment to continuity with existing arrangements with Euratom, Europe’s nuclear safety and research watchdog, a softening of its earlier stance that the UK needed to stay in the group to protect vital nuclear research and new-build projects, and to make sure access to nuclear fuel and medical isotopes is not disrupted. Significant recent progress has been made at three Sellafield projects that have been subject to increased regulatory attention, the UK’s Office for Nuclear Regulation said on 12 January 2018. The US Federal Energy Regulatory Commission’s decision not to adopt a proposal that would have required markets to compensate “fuel-secure” baseload electricity generation was a “missed opportunity” to support nuclear plants whose attributes, including resiliency and reliability and which are not being fairly valued in the market, the nuclear industry has said. The Swedish Radiation Safety Authority, or SSM, expects to make a final decision on plans to develop an encapsulation facility and final repository for spent nuclear fuel on 23 January 2018. The UK is aiming for continuity with existing Euratom arrangements and wants to include Euratom in any implementation period agreed as part of wider discussions on Brexit, energy secretary Greg Clark said in a written statement to parliament on 11 January 2018. Spain’s seven commercial nuclear reactors produced 55.6 TWh of electricity in 2017, making nuclear the energy source that contributed most to the country’s electric system, the Madrid-based industry group Foro Nuclear said on 8 January 2017.